a loss in the Paladins' 28-21 win. Photo courtesy of Furman. So here's something that's not been written in a few decades: Furman travels to Western Carolina Saturday for a showdown of first-place teams in the Southern Conference. Over the years, the Paladins and Catamounts have often played early in the SoCon schedule. So this could be the biggest regular-season meeting between the teams this late in the season since Nov. 11, 1978. A Furman team that was 2-1 in the SoCon traveled to Cullowhee, N.C. to face a Western Carolina team that was 4-0 in the league. The Paladins won 24-7 that day and set the stage for perhaps the most important moment in program history the following week. Back home at Sirrine Stadium the next week, Furman stopped Stump Mitchell on a game-ending goal line stand as the Paladins beat rival Citadel, 17-13. The win clinched the first of Furman's record 13 SoCon championships. Back to 2017. While part of this "battle of first-place teams" required Samford holding off Wofford last Saturday to leave four SoCon teams with one loss, that's not detracted from this unexpected showdown. After going a combined 5-17 last season, Furman and Western Carolina were picked to finish sixth and seventh, respectively, by the SoCon media this year. With four weeks left in the regular season, the Paladins (5-3) and Catamounts (6-2) are tied atop the SoCon with Wofford at 4-1. Samford is a half-game back at 3-1. Western Carolina leads the league in scoring offense (38.6 points per game) and total offense (467.8 yards per game), while Furman is second in both categories with 35.2 point and 426.5 yards per game. "They're easily the most dual-threat team we play. They run the ball really well and their quarterback is a good athlete who can hurt you rushing or throwing," Furman coach Clay Hendrix said. "This is the kind of game where you're going to be in a lot of 1-on-1 situations and you've got to tackle. "It's a pretty intriguing matchup. I know how we will be challenged, but I think we can challenge them as well." The Catamounts' offense features outstanding sophomore quarterback Tyrie Adams, who's thrown for 1,678 yards, ran for 575, and accounted for 17 touchdowns. This week, it should also feature the return of arguably the best running back in the FCS. Despite missing three games with injuries, Detrez Newsome still ranks 15th in the country in rushing with 626 yards and is averaging 125.2 yards per game. With Newsome out, Corey Holloway (376 yards) and Donnavan Spencer (273) have stepped up. The trio each have at least six rushing touchdowns as Western Carolina is four shy of the school record of 25. Both teams are also improved on defense this season. Furman leads the SoCon with 23 sacks, while the Catamounts are second with 19. Western Carolina's defense features eight senior and three junior starters, while the Paladins' entire two-deep on defense has a total of two seniors and six juniors. "I love this defense. 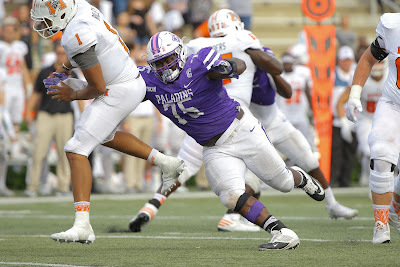 Our first thing is to always stop the run, then when it gets to the pass we just get after it," said Furman linebacker Chris Washington, who has 42 tackles, three sacks, three quarterback hurries, a forced fumble and fumble recovery this season. A key matchup could come when Furman faces third down. The Paladins rank fifth in the FCS, converting 50.9 percent of their third downs. Furman's also been successful on 12-of-16 fourth down conversions, which ranks second in the country among teams with at least seven attempts. Western Carolina is second in the SoCon in third-down defense, allowing 34.4 percent. While Newsome is expected to return for the Catamounts, this could be the healthiest Furman has entered a game in some time. Tailbacks Triston Luke and Devin Wynn are expected to be available for the Paladins. Hendrix said quarterback P.J. Blazejowski, who sprained a knee at Chattanooga on Oct. 7, is just about to back at full health as well. "It'll be nice to have those two (tailbacks) back. Triston Luke especially brings a little toughness to the table, blocking and doing things," Hendrix said. "Just to be able to practice this week and not wear (tailback) Darius (Morehead) out has been good." Kickoff is set for 3:30 p.m. Saturday at what's expected to be a rain-filled day at E.J. Whitmire Stadium. Furman will be looking to extend its winning streak to six consecutive games, which was last done in 2005. "I told them 'usually the team that has the advantage in the weather is the one that thinks it has the advantage,' " Hendrix said. "I'd like to think we're built to deal with some of that and grind a little bit if we have to do that."